Jacuzzi with large sunning areas and teak chaise lounges. The Master and VIP ensuite staterooms are located forward on the main deck. 1. The master stateroom is full beam with a king size bed and includes his and hers marble sinks, whirlpool bathtub and a separate shower room, plus study. 2. The VIP stateroom has a king size bed, luxuriously appointed ensuite with a bathtub and a separate shower room. 1. The FULL Beam VIP stateroom on the lower deck features a king size bed, ensuite with a bathtub and separate shower room. 2. Two twin bedded ensuite staterooms with showers. 3. A queen size bed, ensuite stateroom with bathtub and separate shower. Note: The Upper Salon features a gaming and card table, a full bar area, video arcade games, an air hockey table and a karaoke machine, X-box, Wii, Multiple board games, Nearly 1,000 movies. 1. All staterooms and common areas of the yacht are equipped with Satellite TV and DVD players. 2. Music surround sound systems are located in the master suite, main salon and through the boat deck. 3. Handicap accessible between the main deck and boat deck. 4. 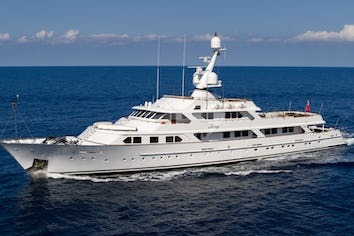 Rebuilt in 2003 and extensively refit from 2008-2009: Complete paint, new carpets, new exterior soft goods, new linens throughout, new galley equipment, new bridge electronics, new main engines, new auxiliary generators, upgraded AV systems throughout, zero-speed stabilizers, air conditioning system cleaned and refurbished, marble polishing and re-grouting and many more upgrades and improvements. All Staterooms and common areas of the yacht are equipped with Satellite TV and DVD players. Music surround sound systems are located in the master suite, main salon and through the boat deck. iPod docking stations throughout. 1. The Upper Salon features a gaming and card table, a full bar area, video arcade games, an air hockey table and a karaoke machine. 2. Large biminis and shade umbrellas on the sun deck for shade. 3. Jacuzzi with large sunning areas and teak chaise lounges. 4. Handicap accessibility between the main deck and the bridge deck. 5. There is a steam shower in the gymnasium. 6. 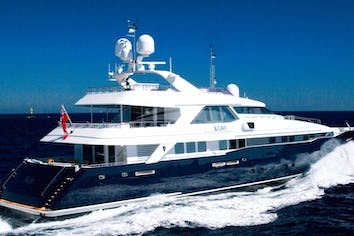 Charter guests have the option to use the yacht's diving equipment, however, Rendezvous diving will still be required. Advertising of this yacht is not permitted in any printed material, on the internet or in any other medium without prior written consent from Northrop & Johnson. 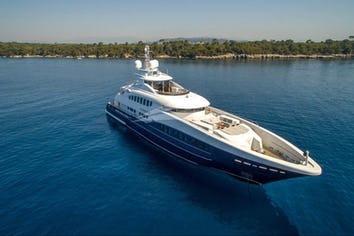 PASSION can accommodate 12 guests in 6 cabins. The Master cabin has a king size bed, bath/tub, shower and toilet. 2 Guest cabins have a twin bed, shower and toilet. A VIP cabin has a king size bed, bath/tub, shower and toilet. A VIP Lower Deck cabin has a king size bed, bath/tub, shower and toilet. A Queen cabin has a queen size bed, bath/tub, shower and toilet. PASSION is fully air conditioned through out. Crew has a separate companionway, heads and shower.